On Sunday May 6 the Maryland Film Festival presented the biography “Love Free or Die: How the Bishop of New Hampshire Is Changing the World”, the story of Episcopal Bishop Vicki Gene Robinson, who was elected to the post in New Hampshire in 2003, after a bitter struggle within the Anglican church about accepting openly gay people into the clergy. The title, of course, is based on New Hampshire’s libertarian state slogan, “Live free or die”. The film, directed by Macky Alston, is remarkable in providing “live” coverage of events spanning so many years. The climax of the film occurs with the 2003 vote in Minneapolis (where I was living when news coverage occurred. The so-called “Anglican Divide” followed as a result. Some of the most interesting footage in the film occurs early with a visit to Canterbury cathedral, which was the end destination of the famous 1944 film by Powell and Pressburger, “A Canterbury Tale”. Reviewed here March 15, 2011. The Church is quite deceptive and evasive about allowing filming. Later, Robinson is shown standing near a bridge near the church that resembles Washington DC’s Memorial Bridge, followed by a conclave in which someone becomes disruptive over the gay issue and must be removed. 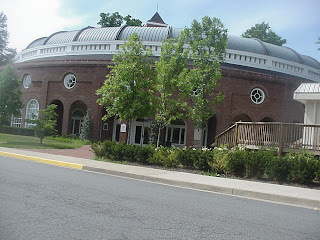 The film was shown in the spacious (Maryland Institute College of Art) MICA Brown Center in Baltimore, and both the director and Robinson were available for a detailed Q&A. Robinson said that at the time, the Anglican Church “risked its life” over the issue. He also said that the US ought to follow the lead of France, and perform all legally-driven marriage ceremonies in a civil procedure, and then have a separate consecration in Church. I asked a question about Edward Wilson’s book (review May 1) and comments about eusociality and homosexuality as a form of diversity that promotes altruism within a group, and Robinson was familiar with Wilson’s arguments. In 1989, I had a co-worker friend who was very active in the conservative Falls Church Episcopal Church. He had a roommate with ties to "Love and Action" and "giving up the gay lifestyle". I've written about that group before (Oct. 19, 2011). That particular congregation, one of the first in Virginia, got involved in the Anglican Divide. The film was produced by ITVS, Reveal Productions and the Sundance Institute, and for PBS Independent Lens. The official website for the film is here. PBS Independent Lens says that the film premiered at Sundance on Jan. 23. Marvel's "Avengers" have to work as a team.